It was always going to be a difficult site to develop. A piece of waste land with a history of fly-tipping and contamination from the engineering works next door which hosted a covered-up stream running through a 200-metre culvert. A different vision, one featuring a beautiful, wildlife-rich New Forest stream running through the Ampress Industrial Park site, was inspired by a colleague during early meetings with the New Forest District Council (NFDC). I have to admit, I was pretty skeptical at the time as it was really hard to see the potential from this piece of tarmac, but my colleague persuaded us all. 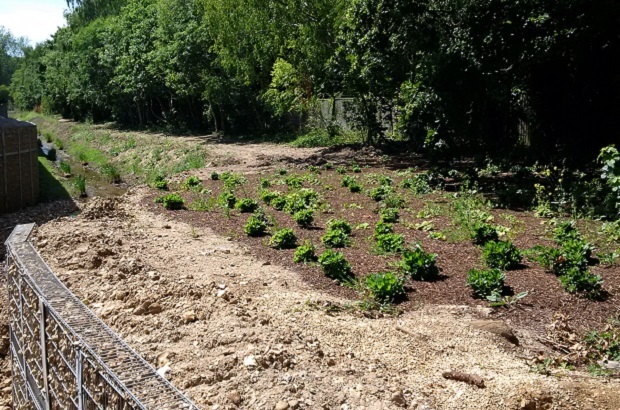 The NFDC agreed that they would ask developers to open up the river to create new habitats and increase biodiversity. It took a while to find a developer to come forward who was happy to take on the challenge. Eventually the Bourne Wood Partnership, acting on behalf of the owner Travis Perkins, found a way to meet all the requirements of the project. The stream channel design was tricky. The walls needed to allow enough depth and capacity to carry flood water at times of heavy rainfall. This was done by inserting sheet piles – sections of steel sheets with interlocking edges – below the water table and sealing the gaps so no residual soil contamination could reach the new channel. 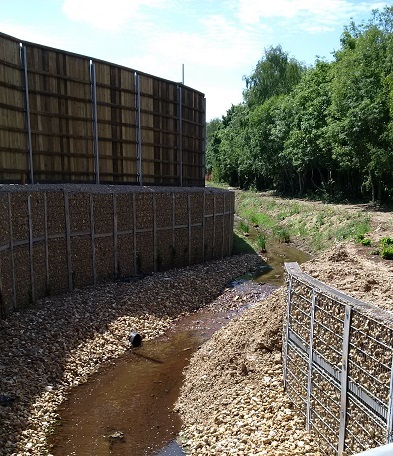 To encourage the vegetation we’d planted to help stabilise the walls, we clad the sheet pile with metal gabion baskets and graded the banks to a more natural slope. The stream was designed with riffles and pools to improve the natural habitat. During the planning we discovered that the site owner Travis Perkins didn’t own all of the culvert covering the stream. The last 5 metres were owned by Hampshire County Council and Bournemouth Water, so we had to use the combined knowledge of the members of our New Forest Catchment team to adjust the plan. After a site meeting, a few phone calls, and a handshake or two, the developer agreed to extend the length of the new channel through Bournemouth Water’s land. They also agreed to add a new footbridge so people could continue to access the footpath on Hampshire County Council’s land. I actually gasped when I returned to the site for the first time and saw the stream, much to the amusement of the developers. The transformation from a piece of bare tarmac to a beautiful stream was amazing. It will take some time to settle in, and for new habitats to be created, but the potential is there for everyone to see as they walk along the footpath next to the industrial site. Fish are already returning to the stream and I’m really looking forward to seeing more wildlife move in over the coming weeks and months. Lucy Roberts is a Technical Specialist in the Groundwater, Hydrology and Contaminated Land Team. She has worked for the Environment Agency for 17 years and was involved in the project to restore Passford Water in Lymington from start to finish.